Here’s something for those that have been intrigued by the “longer than life” highway construction project named I-45 (commonly called the Gulf Freeway). 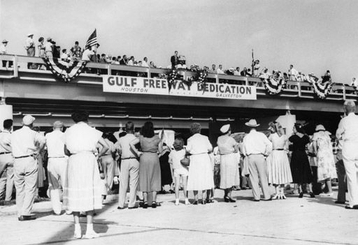 The Gulf Freeway between Houston and Galveston was constructed in the mid 50’s. 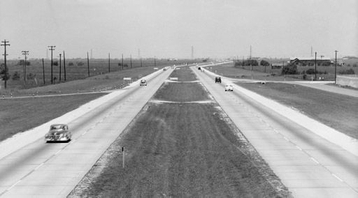 This view near present-day El Dorado Boulevard shows a typical section of the Gulf Freeway in July 1956. Interesting note: The Gulf Freeway was really not a freeway at all in the beginning. Most of the Gulf Freeway was in fact a highway without access control. TxDOT did not purchase access rights along the highway, so only an 8.5-mile (14 km) section in Houston was actually a freeway, and there were 32 at-grade crossings between Houston and Galveston. But it just wouldn't have sounded right to call it the Gulf Highway. Later, frontage roads would be added for the entire length to Galveston to make the Gulf Freeway a true freeway. If they had waited to dedicate the highway until construction was completed - it still wouldn't be dedicated!!! The official dedication ceremony was held on August 2, 1952. Motorcades from both Houston and Galveston met at the approximate midpoint near Dickinson on the FM 517 overpass. By the early 1960s rush-hour traffic jams were part of everyday life on the Gulf Freeway. 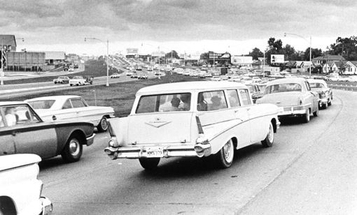 This 1965 photo shows the evening rush-hour backup at the beginning of the freeway in downtown. Researchers at the Texas Transportation Institute used the Gulf Freeway to investigate experimental traffic control practices. This lead to more construction....more lanes....more traffic...more congestion...ad infinitum ad nauseum. Surely this freeway - and those that followed and now crisscross Houston - changed the city forever. How did the Gulf Freeway impact your life? What memories do these photos and this commentary stir up for you? Please click on the word "comment" below and leave your thoughts and/or respond to those of others. And thank you Frank and June! March 3rd...Mike's comments (click and open, below) stirred my memories of camping on the beach in Galveston. I rummaged in the photos tonight and found this photo of a Lofgren family campsite on the beach, dated July 1948. Recognize the Lofgren Kids, below? I realize that Franklin is still living in Md. and is probably not aware (as many of our out of town classmates) that the Gulf Freeway is still under construction! The NASA 1 area is being reconfigured with a new road to take some of the load off NASA 1, meanwhile, us commuters still tolerate the inevitable delays and detours. Also the Galveston causeway has been replaced and is still being completed. Let's see just how long have we been waiting for the completion of this "Super Highway"? I remember the arrival of the Gulf Freeway vividly. There was a contest to name it. Mama dubbed it the "Super Duper Highway", though perhaps that was not original with her. I also remember that she thought the name "Gulf Freeway" was appropriately "correct" but not very imaginative. Ed had a lot of names for the Gulf Freeway as the traffic got heavier through the years. It was our "Highway of Love" as we dated, since his family lived in the League City area. But his later names for the route as we navigated rush hour traffic were not nearly so lovely! You probably have called it some names yourself. I especially remember when the overpass at Broadway and Park Place Boulevard was constructed. Since we lived in the last house on Broadway (there at Sims Bayou where the huge bridge now stands, connecting Broadway to Hobby Airport...the house and most of our 1.75 acres of wooded land no longer exist - but that's another story!)... As I was saying, since we lived in the last house on Broadway the actual construction of that overpass blocked our access to just about everything in our lives at that time. Daddy had a little neighborhood bookstore near the old PP Baptist and PP Methodist churches and it was a mess to try to navigate the drive to work and church for quite a while. Randy and I had to go through that construction area on our bikes every day to get to Park Place Elementary School. One day after a heavy rain - when we foolishly tried to navigate the muddy path through the construction site - our wheels slowly picked up more and more gumbo until we were pushing as hard as we could and getting no where besides VERY, VERY MUDDY ourselves. We eventually made it to school with the wheels so packed we could barely push the tires through the fenders, and our parents had to be called to help us demud our bikes, our shoes, and our clothes. That was not something we did lightly - have our parents called by the school! Does anyone remember the route one took to the beach prior to the Gulf Freeway ( it is still free by the way ) completion? Our family (uncles, aunts, cousins) would converge on Galveston via Hwy 3, (Old Galveston Road), drive right down on Stewart's Beach, find the best spot and tie blankets between the cars to create shade for the elders. I can remember eating sandwiches for lunch (literally) and drinking Grapette. Does anyone remember the Ice House, on the route,where all the bikers would share a "cold one" and rest their Harley's? I think it was called the "Thunderbird". I barely remember standing on a chair to pull the slot machine handle at a little cafe that became Jimmy Walkers. There were rental cabins on the beach and we did campfires to keep the mosquitos away. And of course there was the San Jancinto Inn. Does anyone remember Jack Tar across from Stewart Beach? We went there every summer. Fabulous swimming pool. There was an extremely nice looking life guard at Jack Tar's by the name of Steve. I have movies of the pool and the guard. 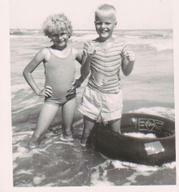 I recall weekend campouts on the beach in Galveston and of course we traveled the "Gulf Freeway". I can still feature the Oleander bushes and palm trees in the center median. Hard to believe that was all that seperated us from traffic flowing the opposite direction, how did we survive without concrete barriers? In particular I remember when we were camped with several aunts and uncles, had a big tarp erected between the cars for shade and an open fire for cooking. We also had rented a 300' seine for fishing-wouldn't the game wardens like to find someone doing that these days. Everything was just lots of fun, until the sun went down and one of those wonderful tropical storms blew in! We lost all of our camping gear and were lucky to get out alive. Camped way down the beach away from everything-one of the cars got stuck in the wet sand and we got it pulled free, as the heaviest part of the storm came ashore. That was a very frightening trip. Yeah, I remember the Gulf Fwy. Every morning I got on it at the ramp just before it went over Griggs Rd. and fought the bumper to bumper line all the way into downtown where it dumped onto Pease or was it Pierce...who cares! One of those streets that had around 150 stop lights on it all timed to make the trip at a miserable 20 mph! After finally making it to Smith St., I turned left and proceeded about a mile to the still new Southwest Fwy. which took me out to Buffalo Speedway and the Humble Research Center. Then, at 5 pm, I did it all in reverse in a stick shift car. My left leg was bigger than my right! Never again! I remember the Thunderbird! Sawdust floors, ice cold drinks in the box -- good times! On the way back from Galveston, Mama would yell to us kids, "What's the word?" and we'd yell back, "Thunderbird!" We'd be running and playing, while the adults drank a couple of beers. God those were good days. I actually got onto the internet today trying to see if I could find anything about the Thunderbird. I'd love to have a photo of that place, but I'll be surprised if anyone has one.